which was given at Mount Sinai to Moses and to God’s People. And they fell to their faces, did you notice? We might wonder? Why did they respond the way they did? Then, in the Gospel, Jesus himself is reading from the Scriptures. who will set free those imprisoned by sin and guilt. how people reacted, and why. In fact, next Sunday’s Gospel will give us the people’s response. There were three ways they responded. Some said, in effect, oh, isn’t he nice? And still others reacted by seeking to throw him off a cliff. And of all those reactions, the one that makes the most sense? Those who tried to throw him off the cliff! To this day, these are still the responses people give to Jesus. Lots of people today will say, oh, isn’t he nice? and he turned over the tables? That was not so nice. claim that Jesus has nothing special to say. it’s all bosh, and they aren’t going to be taken in! the person who sees through everything, in fact sees nothing at all. So those folks who went to throw him off the cliff? then you realize, this fellow is trouble. Big trouble. is also anything but a good man. In fact, he’s a very bad man. But no matter what, you can’t just pass on by, nodding amiably. Whatever or whoever Jesus is, he’s not the same old thing. and he’s standing right in front of you. “Oh how nice!” is not a proper response! One response we might have to Jesus is to want to know him better. and they realized they’d lost so much. and reclaim what is yours. because they don’t know their Faith as well as they might. I’m here to say, one more time, rise up, claim what is yours. available online, and also the discussion groups. Lent starts in about three weeks. So we’re gearing up Symbolon, Part 2.
are about the Seven Sacraments. Now, to be clear, if you didn’t join in part 1, don’t let that stop you. see the cover of the bulletin today, or look for a mailing. Also, while we’ll focus on the next part of the Symbolon program, remember the website, Formed.org, has lots of options. It’s all free, and it’s all for you. is to help him bring good news to the poor, and to set captives free. to support six important missions of the local Church. and the Archdiocese’s programs for sharing the Catholic Faith. and many of us will get mailings as well. Our parish has always responded generously. and that helps with our religious education programs. These are all worthy causes. Personally, I write my check each year for the seminary. so I can afford it. You do what you can afford. Some can afford a lot more; others nothing close to that. is a very good response to Jesus coming close. Like the people in the Scriptures, you and I have heard God’s Word. present right here, on this altar. All this is fulfilled in your hearing, and before our eyes. I'm in Puerto Rico for a few days on vacation. Why Puerto Rico? Why not? It's part of the U.S., but assuredly warm; it's not too far; and I've never been here -- I like some adventure. But the clincher was, I got a bargain. Well, American Airlines' customer service could have been more helpful -- and I could have been more assertive. My flight from Columbus was delayed for weather, leaving me only a few minutes to get to the next flight. One of those carts would have made the difference. I didn't ask; but then, I didn't know how far I had to go. Next time, I'll ask. My car rental was all goofed up. When I booked, I didn't realize it wasn't at the airport. The guy at the airport explained. Ok, so can you rent me a car? Yes, but the taxes make it more. How much? He took awhile to discover it would add $500 -- tripling the bill! Dubious, but between a language barrier and my weariness, I was in no position to argue. The place where I'd gotten the reservation was closed -- thanks American! -- so it would have to wait till the next day. So I caught a taxi to my hotel. That was the slowest taxi ride I've ever had, by the way. The driver was with her husband, I think, and rather nervous. So, the next day, I see there's a rental place nearby. I call. No cars. I couldn't find a number for the office that had my reservation, so I couldn't do much with that. The car finally came through yesterday. Oh, and I found out why this place was a bargain. In the daylight, I discovered, across from the hotel, a country club that's out of business. The apparent plan was to have a golf club, with houses surrounding, and a couple of hotels. Well, it's all here, except the golf course has gone to seed. ; the birds have taken over. I'm sure the homeowners, who banked on a golf course, are delighted. No doubt the hotels did too. They are both fine, but the one I'm in shows a little wear. Meaning, not enough money for upkeep. All that sounds too negative! And I didn't even mention my cold, which is about gone. I might have also mentioned the swaying palm trees, the lovely people -- people are nice to you, despite language, if you are polite, and at least try. I might also mention the curious night sounds, birds and frogs, that have made the abandoned golf course their home. The food has been good. The main thing is, rest, prayer, and relaxation. It is sunny, warm, and I am just finishing my coffee. I’d like to tackle a couple of questions with you. why was Jesus himself baptized? as an expression of sorrow for sins. it was like lining up for confession. You were there to tell God you were sorry for your sins. So why was Jesus there? for the same reason God became human. is that God was coming to be with us, to stand with us. that Jesus was standing with the sinners on the riverbank. That’s why Jesus came. He comes to be with us. Have you ever thought about that moment? that suggests Jesus was standing there for awhile. Sure, he could have gone to the front; but what if he didn’t? Can you imagine standing next to him all that time? What went on during that wait? the way folks do while waiting outside the confessional. But maybe they were talking. and Jesus is standing behind you. That’s what the Incarnation—God becoming human—is about. God chooses to take part in all that he asks of us. beginning our life in the Holy Spirit. but where we go, he goes. that is, he’s the Messiah – as well as showing he is the Son of God. first he went down into the river, and received a ritual bath. That is, he was baptized. And then, coming out of the water, he was anointed. This ritual was overseen by the chief priest, and the prophet. the true King, entering into his kingdom. the Holy Spirit, in the form of a dove. Why a dove? Why not flames of fire, as on Pentecost? Why not thunder and lightning, as at Mount Sinai? Well, I don’t know for sure, but here’s a thought. A bolt of lightning tends to send people scurrying for cover. God’s purpose here wasn’t to intimidate. Is a dove frightening? In the story of Noah, a dove is the sign of life and of hope. The second question I want to tackle is, what does all this mean for us? Of course that means Jesus. But don’t stop there. It also means us. Get that? That’s the whole point of the Incarnation. God came to be with us, so we could be with God. Which is to say, to become partakers in divinity, to share God’s life. shows us the meaning of our own baptism. When we are baptized, we receive the Holy Spirit. Jesus’ baptism isn’t the end, but the beginning. From here he goes into the desert to do battle with Satan. he performs his first miracle at the wedding in Cana. We’ll hear that Gospel next Sunday. constantly seeking out the lost sheep of Israel. He is also on the move, heading toward the Cross and the Resurrection. This baptism is the launch, as it were, of his Messianic ministry. And you’ve heard me talk about the task of sharing our faith. This is why we’re anointed with the Holy Spirit. It’s what we’ve been prepared, spiritually, to do. You may think you can’t do it; that you aren’t equipped. First stop, after the bathroom, was the church sacristy. I turned on the lights and put on my vestments for Holy Mass. As I am in the habit of preparing my chalice the day before, I only needed to double-check it. Then I sat down to pray the Divine Office. As the faithful are usually praying the Rosary about this time, I pray in the sacristy, contemplating the crucifix and the relics that are kept there. The seminarians, home for Christmas break, come in; they vest to serve Mass, and take care of the candles and so forth. The volunteer whose turn it is to take Holy Communion to the sick checks in just before Mass. After Mass, the servers take care of business. I greet a few folks after Mass, then I get the altar set up for the Traditional Latin Mass (low) later on. I like having things set, just in case I get called away. Back to the house. I fix some coffee and some eggs. I bring my breakfast to my desk, where I check emails and do some online reading while I eat. My assistant stops in with some questions. That's when a couple came in, preparing for marriage. We met for 90 minutes -- actually, a little longer. I talk too much. They pretended to find it helpful! I had another meeting at 3:30; in between, my assistant had some checks for me to sign. That takes time, especially when I review the invoices, which is what I really should do. This time, I was a little hasty. Sometimes people say priests shouldn't worry about such things. But I'm a father, right? My father always handled the bills. He didn't "shop it out" to anyone, unless it was my mom. That's what the head of the household does. My second appointment just left; afterward, I saw a few more checks needing signatures. I just finished that. Now I have some time before the Traditional Latin Mass tonight at 7 pm. FYI -- before Mass, I not only prayed Morning Prayer (Lauds), I also prayed Daytime Prayer (Terce), because (a) it's allowed and (b), I know how a parish priest's day goes. I'll pray Vespers (Evening Prayer) before Mass tonight; and if possible, Matins (Office of Readings) for tomorrow. I still have my Sunday homily. I didn't neglect it; part of my decisions today had to do with whether I did a homily on the Catholic Ministry Appeal -- since I won't be able to do it on the 17th when I'm away -- or else, do it January 24. I opted for the latter. Sometimes homilies don't come together until the last minute. Tomorrow, in addition to a morning Mass, and the evening Mass, and two-plus hours of confession, I have two appointments. With God's help, I'll come up with some sort of homily before the evening Mass. Even though I didn't eat lunch, I probably won't have dinner until after Mass tonight. Because we'll have exposition and devotions to the Sacred Heart, that means around 8:30 pm or so. I don't really like to eat, and then go to have Mass or a meeting. This is a pretty typical day, although not so typical for a Friday, because I don't usually have meetings on Tuesday. 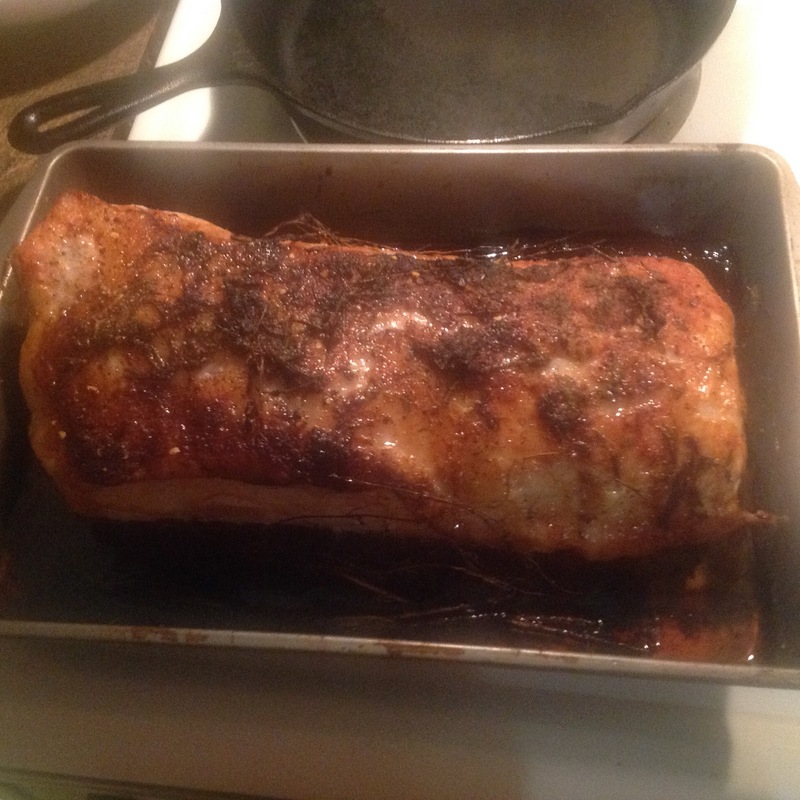 Last night I fixed a pork loin. I originally planned to fix this on New Years Day for some friends I'd invited over, but one after another called the day before to say they couldn't come, so that party got cancelled. As I had other plans for Saturday and Sunday, Monday was my next opportunity to prepare this. 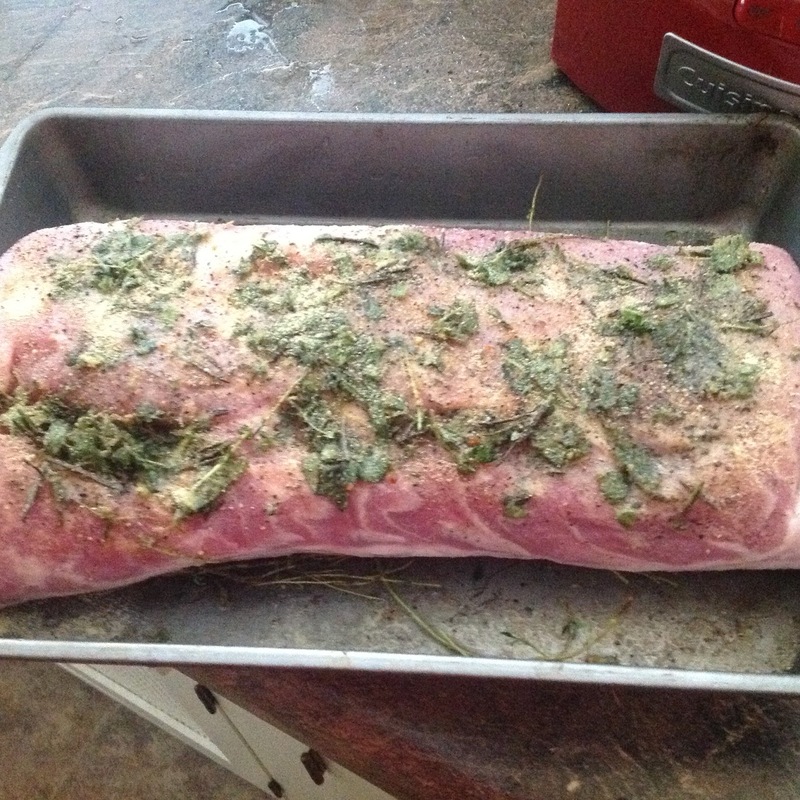 My original plan was to use rosemary and garlic; however, when I stopped at the store last Wednesday, the rosemary was gone; but there was a "mix" that had some rosemary, plus some sage and thyme, so I got that. 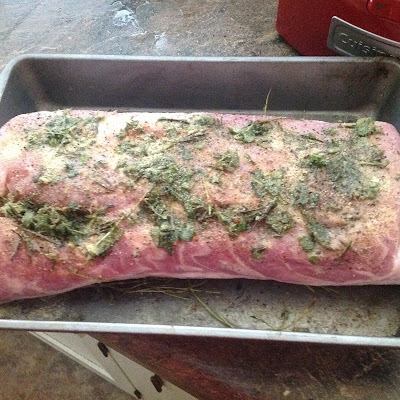 It had enough rosemary both for the chicken I prepared Thursday, as well as for this roast. Then, when I went to the cupboard for some garlic, I found the bulbs all dried out. So I used powdered, which works pretty well. After about an hour or so, here's the roast. I cooked it to about 150 degrees, a little past where I wanted it; but as I was finishing the roast, a friend called and needed to come by. So I had to delay dinner a bit. He actually joined me for dinner, although he'd already eaten, so he just watched me eat. For my friends who didn't make it on New Years, I had plans to make rosemary potatoes with this; but I decided to let that go, as I had some spinach, so I sauteed that. My friend helped me dispose of a bottle of sauvignon blanc, as well as some of the cheesecake I made for the seminarians. I had two slices of the roast, and the rest will be my meals for the rest of the week. There’s so much artificial light in the sky today that we miss a lot. you told yourself, nothing was there? and at the end of my life found out that I missed it? that we give our children, and the names we bear. with zero success! ), I’m going to give some anyway. First, may I suggest that you pray about what to name your child? The name we bear is a powerful sign of who we are. And your child’s life will be shaped by the name he or she bears. to choose names of saints, including Biblical names. even when people don’t know it. or a site called Behind the Name. Please give your child at least one saint’s name, if not two. know what patron saint you have in mind. That made me sad, because my parents told me who my patron was: Saint Martin de Porres. As I grew up, I learned more about him. who you can call your own! what do you do? No problem. You can still choose a patron. Give it some thought. Pray about it. I’ll suggest Saint Boniface as his patron. Son of David, yes; Savior, yes; but also: True God from True God! * I just discovered this site is now called Catholic Saint Info.